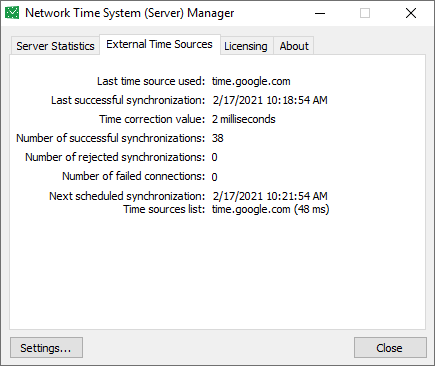 Network Time Server is part of the Network Time System package used for setting up and running a dedicated time server on the company network. The application is capable of time synchronization with external NTP/SNTP sources - public NTP time servers or local trusted time sources such as NMEA 0183 GPS receivers (via COM, USB, Bluetooth ports, TCP/IP, UDP multicasting), radio clock cards, NTP servers etc. 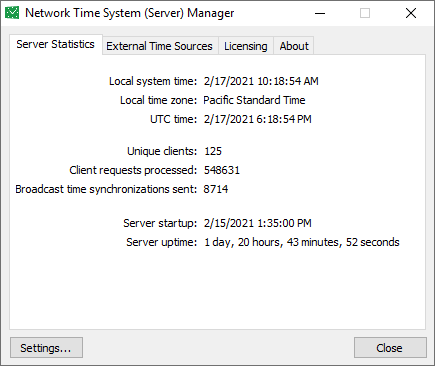 Moreover, it can host the time received from an external time source for Windows workstations, any NTP/SNTP compatible devices and non-Windows NTP clients. 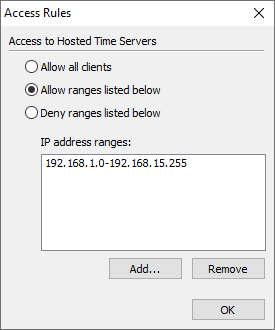 This allows you to synchronize time on various hardware such as routers, switches, IP cameras and computers running operating systems different from Windows. 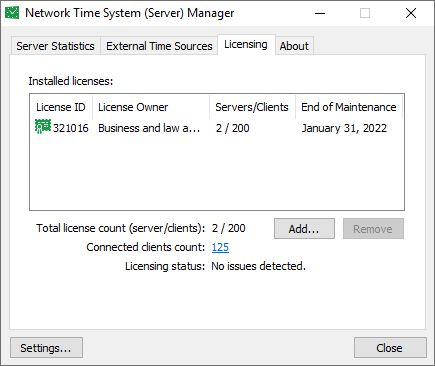 The time Network Time Server receives from an external time source can be customized in a few ways, including converting to the local time and applying a custom offset. Configuring several external time sources such as NTP, SNTP servers or NMEA 0183 GPS receiver helps you ensure a dependable system of precise time. All major events relating to both the internal time server and external time sources are logged to the Application Event Log and separate text files.